... and from time to time we serve free Russian blinis for breakfast! 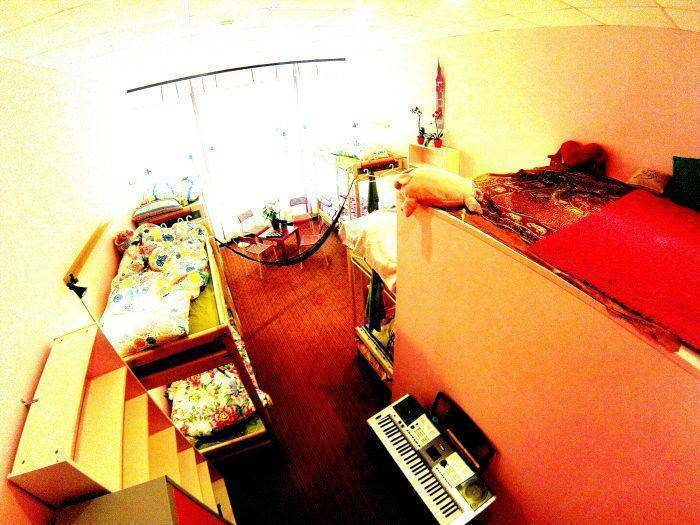 The Hostel is owned and run by a local Russian family who will be more than happy to provide you with plenty of information about the city and how to get around. We prepare budget delicious homemade Russian dinners where you can easily meet many people and socialize even if travelling alone. 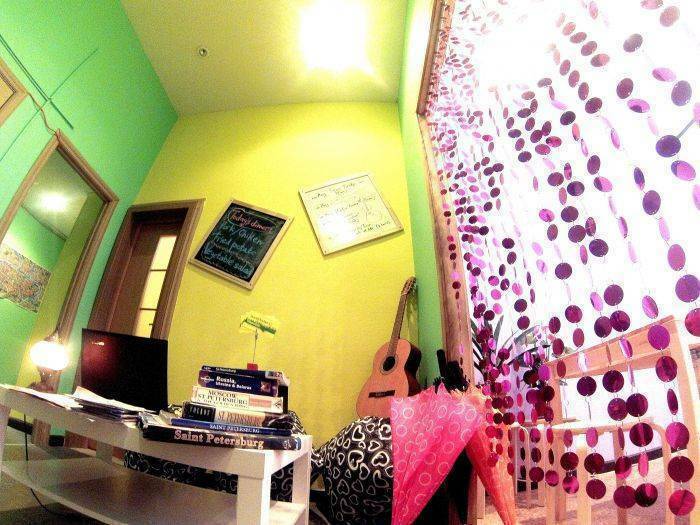 We created a funky CHILLOUT-zone in the mixed dormitory where our guests can rest on 2. 5 metres high while another guests are relaxing in the HAMMOK beneath. We can offer lots of little extras to our guests, from Russian soup ‘borsch’ to live performance of Russian folk songs on the guitar and smoking HOOKAH, not to mention famous Russian Welcome drink-vodka! We have many tours to offer, from the boat tour in the centre of the city to a fishing trip or kayaking in the surroundings of St. Petersburg. We also can arrange for you a Tourist voucher / Invitation and booking confirmation for visa support. 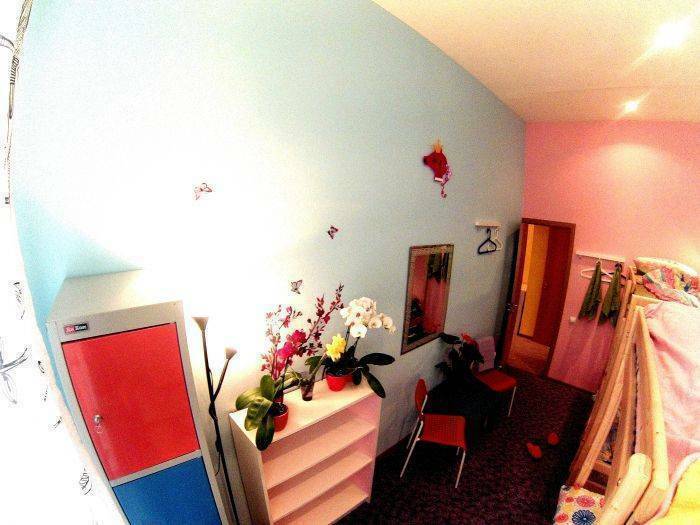 Our Hostel offers to the guests different types of rooms. All the rooms are comfortable to live in: spacious, with high ceilings, every bed is equiped with reading light, soft carpet on the floor in each room encourages you to walk barefoot in spite that fluffy room slippers are given to each guest. For those who likes to meet new people, find new friends and actively socialize with them we can offer a big dorm with a funky CHILLOUT-zone where our guests can rest on 2. 5 metres high while another guests are relaxing in the HAMMOK beneath. 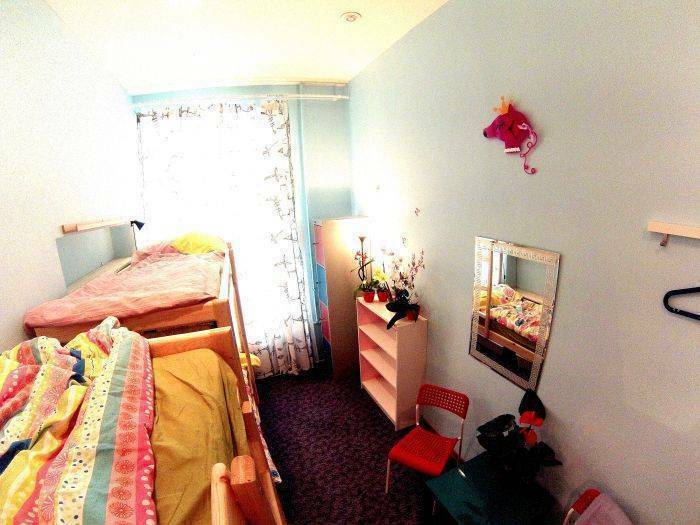 For shy girls we have a separate room with sky coloured walls and wonderful inside yard view. For those who used to travel small groups or for the pairs we can offer wonderful, very comfortable, cozy 4 mixed dorm Butterfly and double room Sakura with king size bed. Our hostel is located in the building of 19th century in historical centre between Nevsky Avenue (the main street) and Liteyni Bridge (open bridge is the symbol of the city). We're just a few minutes walk from Neva river, the metro station, the buzzing downtown and amazing nightlife. It's about 15 minutes' easy walk to Nevsky Avenue. Surrounded by impressive buildings of 18th and 19th centuries in the heart of St. Petersburg, our Hostel gives a great location to explore the city! 2) Free transfer FROM and TO the airport (railway station) for Reservations within a duration of 6 days. We can arrange a pick up for you from the airport for EUR30 or US40. Transfer from Moskovskiy Train Station will cost EUR15 or US20. Please let us know by the e-mail if you need a pick-up. Take a bus to 'Moskovskaya' metro station, the buses number 113, K3, K213 or K13A if you are going from terminal 2 (international), and bus 39 or K39 if you are going from terminal 1 (national), go to ‘Chernishevskaya’ metro station (see below for further instructions). Buses and metro works from 05:30 AM to 12:40 AM!!! Take a metro ‘Chernishevskaya’ metro station (see below for further instructions). When exiting the metro go to the ‘Prospect (avenue) Chernishevskovo’. Turn right and go along this avenue till the second crossroad with the street ‘Chaykovskovo’. Turn left and go along the street ‘Chaykovskovo’ until you see number of building #41 on your left. Come into the 1st iron gate between the café-bar ‘ТРОЯ’ (TROYA) and bank ‘РОСИНТЕРБАНК’ (ROSINTERBANK) and then turn right in the yard. Or you can go further along the street until you’ll see the number of building #33-37. Come into the 2nd iron gate (it looks like it is closed but for pedestrians it is always opened, just push it) left to the shop ‘ОРУЖЕЙНЫЙ САЛОН ПРЕМИУМ’ and then turn left in the yard. In the yard you’ll see the beautiful porch with RED DOOR and the iron light above it. Taxi fare from the airport can be different depends on time, around 1000 RUB, if you go from Moskovskiy Train Station it's about 400 RUB. BE AWARE of private taxi service - even if they say they are on a meter, don't use them because they will try to get more money from you! Use a taxi office inside the airport to book a cab. Avoid offers of the taxi drivers even if they have the company badge with them. Discuss the price and take the receipt before starting your journey.